otherwise one risked being stabbed and skinned by enemy warriors who most likely parade their carcasses as prized trophies of war. These were not the only trophies displayed or carried around proudly. Sometimes, some warriors were badly wounded with zigzagged stripes like those of a Zebra. Many such were often left to die. In the event that they brave the odds and survived those damaging beatings to their bodies, they were often left with a disfigured and twisted body form. To many a warrior, this disfiguration was nothing to be ashamed of. It was a testament to the fact that they were survivours; they went into battle and came out victorious as such, they brandished their disfigured stripes and all as prized trophies to any who cared to see and hear their tale. Sickle cell warriors similarly have a battle of sorts to fight. Theirs is fought within the confines of a hospital dressing room filled with antiseptics and what have we. Their weapons are injections and a host of antibiotics administered regularly to combat this common enemy to many a sickle cell warrior. Many have to go into this battle field again and again; depending on how often the enemy decides to strike dealing with pains, agony and facing amputations. But then what kind of battle is this? Screams and wails become akin to the victory cry of a warrior in a typical battle field. We are talking leg ulcers. Yes you heard me right leg ulcers. Sickle cell patients have a hard time coping with any wound, especially wounds that develop around the ankle area. This is probably due to their already weakened immune system. However, many medical journals show that leg ulcers are a common enough occurence to the majority of sickle cell patients. It is a bit difficult to pinpoint why some wounds automatically result to ulcers. Nevertheless, factors such as poor blood circulation around the wound added especially to the already weaken anaemic state many find themselves in is a possibility. It is well known that among other things one of which is healthy lifestyle, blood flow and circulation is essential to accelerate wound healing. That notwithstanding, dealing with the leg ulcer is every inch a battle. The constant hospital trips, the numerous injections, the uncountable painful scrapping and debridement that elicit screams from patients, the high risk of losing limps if they don’t properly heal. The list goes on. They say only those who wear shoes in this case stripes know where it pinches (pains) it is therefore only reasonable to conclude that if you have never been a victim of a leg ulcer, you can never truly understand the pain and agony that accompanies it. Just as anyone can be a warrior but only those who have engaged in warfare understand the agony of a battle field. You come out scarred and you wonder if you will ever wear those heels you have been dying to have? Never mind that you can’t wear the heels but you certainly still have the legs to wear ‘two ropes’ and move around. Some come out limping on crutches. Does this mean sickle cell warriors who never had leg ulcers are not warriors enough? No. Neither does it make what they go through less a battle. The crux of the matter here is that if you have never been ableto pass through the agonyof a leg ulcer, count yourself mighty fortunate and take all precautions possible to make sure you never. If however, you have been through this road before, then be proud to be a survivor. I don’t here mean you go about bragging. It is not something to be proud of but neither is it something to be ashamed of. Just like any typical warrior, the scars are your stripes incurred in the line of battle and there is nothing to be ashamed of the disfiguration of your body. On the contrary, even if it doesn’t make your leg the best to win the Miss Universe leg pageant, it made you the noble prize winner of courage under fire; something only few people can actually brag about. No corrective surgery, no scar removing creams just wear your stripes. They are a reminder of a baptism of fire you passed through again and again and each time, you come out victorious. Prev PIDGIN: A Cultural Heritage We Should Shun Or Embrace? Courage they say can only live in a world of fear without which courage has no significance. Love it. Exactly so Emmanuel. Thanks so much for stopping by and for the ever ready kind words. Thumbs up! An excellent write-up but as you say, anybody can be a warrior but only those who have engaged in warfare understand the agony of a battle field so we just have to see their stripes and respect them. Exactly that Olivette. Thank you so much for stopping by. Please comeagain and keep reading. Great write-up! And truly, only those who have walked that path can fully understand. Just wondering if anything can be done to avoid leg ulcers for sickle cell warriors? Yes, warriors fight their enemy with bows, arrows, spears, etc (injections, antibiotics) but they also have PROTECTIVE weaponry like shields, helmets, war sandals made from animal skins. 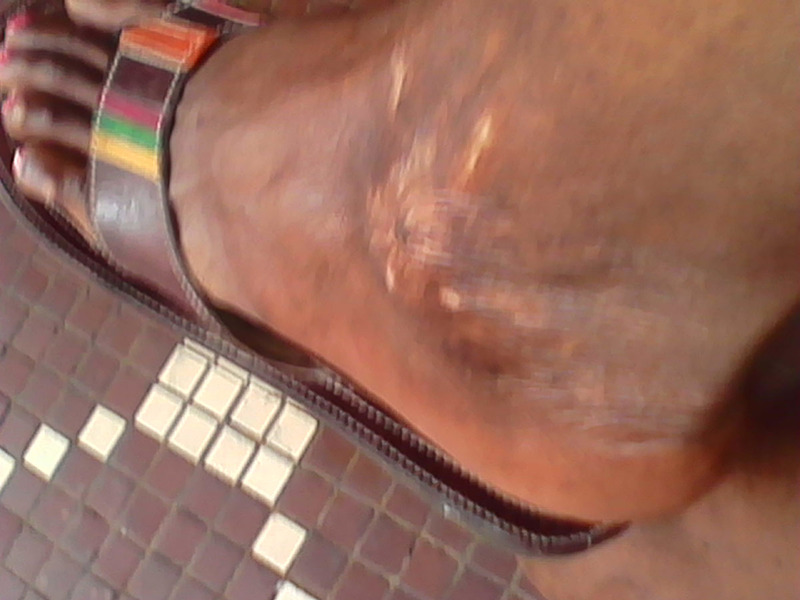 Nothing can be Done to prevent leg ulcers in sickle cell warriors? Jurence thanks so much dear for stopping by and raising an interesting question. you are right warriors have protective weaponry. For sickle cell warriors, prevention is usually the best protective shield they can have. Which means they treat any scratch with the utmost care and choose healthcare providers who understand the disease well. Mine resulted mostly out of negligence. The healthcare personel we chosed didn’t consider my scratch serious enough and before we could realised it, things took the turn for the worst rather rapidly. And there the battle began. Knowledge is always the best defence. I see… Good thing you’re writing and bringing these aspects to light. Keep up the good work. You are one great warrior not just because you overcame this one too because you talk about it… so much courage in one person. Thank you so so much for the kind words. With people like you cheering, it makes it much more easier. The plight of a warrior is characterized by the signature of a warrior, in the case of SC, the scars and sometimes fresh ulceration around the ankles. They are hard to heal b/c the tissues are hypoxic (low oxygenation) as a result of poor blood supply mostly due to the sickle shape of the red cells. You have to keep on fighting; the antibiotics and pain killers prevent infection and suppress pain, iron tablets maybe of help. Thank u so much for the enlightenment. Keep up with the great work. On point T.Agbor. Thanks alot for adding that medical explanation. For real poor blood supply is a huge hindrance but then life is still beautiful with the scars and all and so we keep fighting. Thank you. Warriors indeed… A new aspect of SC I learnt. Excellent write up, not a pleasant topic but worth creating the awareness. My prayers go out to all SC patients. Keep fighting, your courage is an enlightenment. You are true soldiers. Thank you for this post. Thanks for the love and prayers together the battle is easier. Certainly a hard fight… Till the end fight it good! Merci Arnold! Thanks for stopping by. Sure a hard one and yep fighting till the end and hopefully the end is faaaar :)! There is much noise about diabetes and other disease but very little about Sickle cell because many consider it a taboo topic to talk about especially if there is a child present in the family. That is the reason why many are not aware about these leg ulcers affecting many sickle cell patients. Glad this was enlightening to you, Prudencia. Thank you dear for stopping by and for always. Your scars are you trophy, your bounty, your badge of honour, your medals of merit and proof of the fact that you fought to win and won to fight again. FIGHT ON SOLDIER! Beautifully said Sis Maureen. Thank you and yes the fight goes on. Thank you for always following and having an encouraging word or two. Much appreciated. Oh wow thanks alot for the kind words Maryben. Was great meeting you. Thank you for stopping by. I sure will keep keeping up. Thank you. Please come again. Dear Arrey am always carried by your write ups especially with your intro. Very captivating. You are a true warrior to always defeat your enemy and relate the story. Just learnt about ulcers and sickle cell victims which I did not experienced with my kid bro who was finally defeated in the battle field. I pray you always defeat this enemy whenever he strikes so you can always make a mockery of him in Yr narratives. Be Courageous Ma Arrey. Hi John, just seeing this now. Thank you very much for those encouraging words. Yes, leg ulcers are a common enough occurence for sickle cell warriors though many are fortunate not to pass through this agony. Your late kid bro was an eg. Sorry for your loss. Thank you so much for the kind and reassuring words. Someday, I may bow but until then, with God’s help, I pray to keep fighting for a long time to come. Hello superb website! Does running a blog like this take a large amount of work? I have virtually no understanding of computer programming but I had been hoping to start my own blog in the near future.